Reference production rates and fit values are computed using this page and this calibration data set excerpted from the supplemental data table in the paper. This differs from the calculations in the paper in that all samples are weighted equally according to their uncertainties, rather than all sites being weighted equally. However, this method ensures that exactly the same code is used for both production rate and exposure age calculations. Note, however, that the results of both methods are indistinguishable. Scaling scheme fits to calibration data: This plot shows the fit between each scaling scheme and the calibration data. 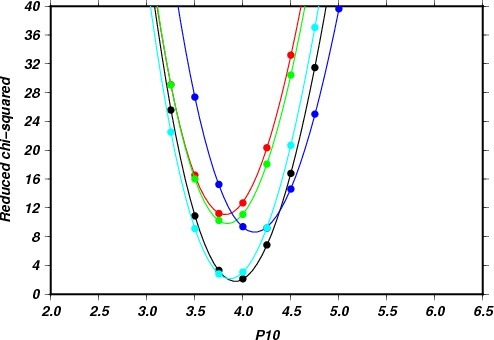 The filled circles are calculated reduced chi-squared values for evenly spaced trial values of the reference Be-10 production rate. The corresponding lines are the polynomial interpolations used to determine the value that minimizes the fit parameter. Colors: black, St; red, De; green, Du; blue, Li; cyan, Lm. If the lines don't go through the corresponding colored data points, or if they don't look more or less parabolic, there is likely a problem with the fit algorithm. Same thing, different presentation:This plot shows ratios of exposure ages for the calibration calculated using the best-fitting reference production rate (t) to the actual independently determined ages of the sites (truet). Color coding for scaling schemes as above. The gray band represents the 1-std-err uncertainty in the best-fitting reference production rate. There is no particular significance to elevation as the independent variable other than that it usually spreads out the data nicely.